Hands up if you want to spend Christmas at Coombe Mill Farm! As a copywriter I get to write about loads of different topics for a variety of clients. I love it! And as a mum of two it’s always fun writing copy for holidays and attractions that my little ones would enjoy. So when Coombe Mill Farm asked me to write a guest blog describing nearby visitor attractions in North Cornwall I couldn’t resist. If you’re planning a trip to the area this is a must read. 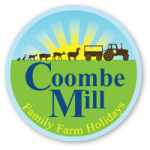 What’s more take a glance at Coombe Mill’s website and you quickly get a feel for the magical family holiday you’d have. Just imagine roaming free in acres of open air space, tractor rides, farmhouse cooking and getting stuck in with farm life. Kids in welly-boots, feeding animals and bedding down in a beautiful Scandinavian style log cabin at the end of a busy day. How idyllic. In fact I’m excited just thinking about it. And now Coombe Mill have gone and launched an unmissable competition to win a 10-day family holiday this Christmas. Needless to say I’ve entered! Why don’t you? It’s quick and easy and you’ve got until the end of January. Just click this link and follow the simple instructions. I’ve got my fingers tightly crossed! Georgina, this is wonderful. Thank you so much for writing this in your own beautiful style and best of luck in the competition.